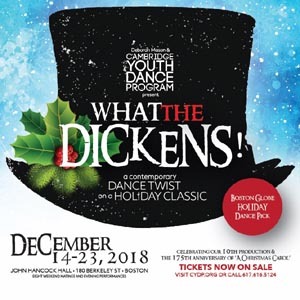 Celebrating the 10th Anniversary of ‘What the Dickens!’ and the 175th Anniversary of ‘A Christmas Carol’, Deborah Mason's Cambridge Youth Dance Company, with their roster of stellar guest artists (and some surprise appearances! ), are bringing their acclaimed production of 'What the Dickens!' to John Hancock Hall for eight performances, Dec. 14 – 23, 2018. Weaving contemporary dance, ballet, tap, hip hop, flamenco, projections, narration and more, ‘What The Dickens!’ is an enchanting dance-theater rendition of Dickens’ classic, timely story of transforming greed into kindness and joy. WHAT THE DICKENS! is a great show for the family, both affordable and intimate. Boston Ballet alum Clyde Nantais returns as Ebenezer Scrooge, Ryan P. Casey and Jenny Oliver as Bob and Mrs. Cratchit, Yosi Karahashi as the Ghost of Christmas Future, along with other collaborations with artists, set building, and costume design.